It's been a while since we've shared some weekly China cleantech news. We had interrupted this good habit last year due to some internal changes. Answering the requests of many of you who have kindly contacted us, we're now thrilled to re-launch the effort, especially as plenty is happening and the Chinese cleantech landscape is more exciting than ever. We're starting with this simple info-graphic summarizing the growth in the power market during 2017, to make sure everybody is up to speed. Starting next week we'll revert back to our standard format with 5 selected news items along with summary analysis from our experts. We're always happy to exchange on the Chinese Cleantech markets with you, learn about new technologies and make new friends, so don't hesitate to reach out. Thanks to all for your precious support ! Offshore wind currently occupies only a small percentage of China's total wind generation capacity, however we expect it to grow steadily over the coming years. China has currently set out a national 5 GW target for offshore wind development, with Fujian slated to be the centerpiece of this development. The Fujian Putian Nanri offshore wind project's total installed capacity of 400 MW is currently the largest offshore wind project in China. 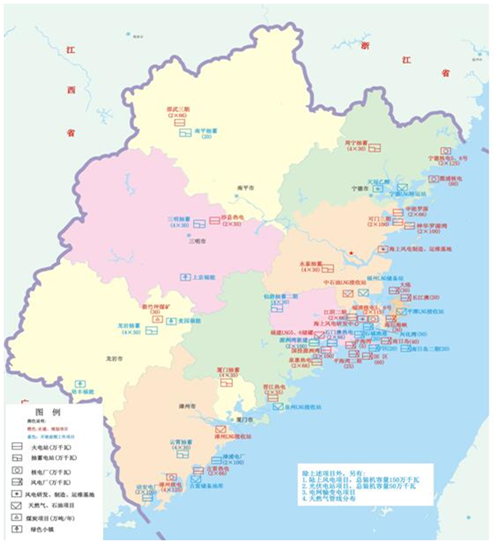 Under the national target, Fujian province plans to reach 3 GW by 2020, or 60% of total offshore wind. However the provincial development target is more vague, simply calling for a “doubling of 2015 installed capacity”. While doubling 2015's 1.72 GW would certainly surpass the national target of 3 GW, the noncommittal language used for the provincial target is reflective of the difficulties China has faced in developing offshore wind, with it's attendant technological challenges, greater investment needed and longer build-out period. While not specified in the most recent Solar Power Development Plan, under the national Electricity Development Plan, the Solar Power target for 2020 contains a 60 GW sub-target for distributed solar. Anhui province currently has 3.45 GW of installed solar capacity, however, only 780 MW of this is distributed solar. 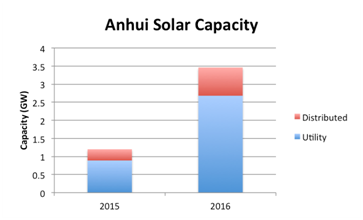 Nevertheless, this installed capacity figure still makes Anhui the fifth largest province for distributed solar in China. The top four are Zhejiang (2,070 MW), Jiangsu (1,730 MW), Shandong (1,190 MW), and Guangdong (880 MW). Developing distributed solar has been more difficult than utility-scale projects primarily due to the high self-consumption threshold requirement set out by the NEA. The requirement mandates that at least 80% of the self-generated power will be consumed on-site with no more than 20% of the power sold back to the grid, and largely limits the applications of distributed solar to energy intensive industrial parks. Therefore, successfully integrating distributed solar with heavy industry will be key if China's ambitious 60 GW sub-target is to be met by 2020. Authorities continue to struggle with high curtailment rates in many provinces due to significant installed capacity, low power demand, or transmission bottlenecks constraints. 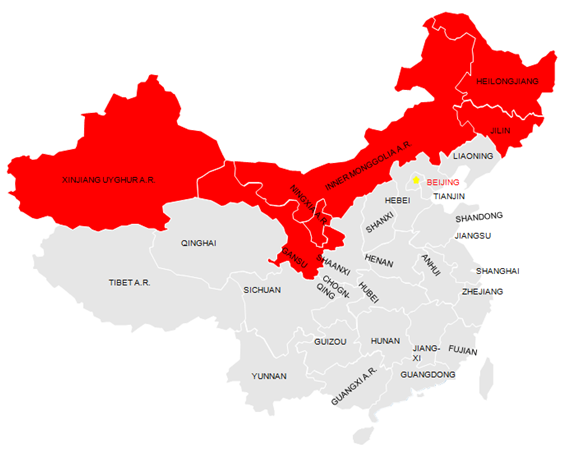 The red-listed provinces account for over 76 GW, 51% of total wind capacity in China. Individually, the affected provinces all experienced high levels of curtailment in 2016, with Inner Mongolia (21%), Jilin (30%), Heilongjiang (19%), Gansu (43%), Ningxia (13%), and Xinjiang (38%). The intent of the temporary ban on project approvals is to push project development southward. The halt corroborates with the trend to push wind power development away from Northern areas and towards the South. 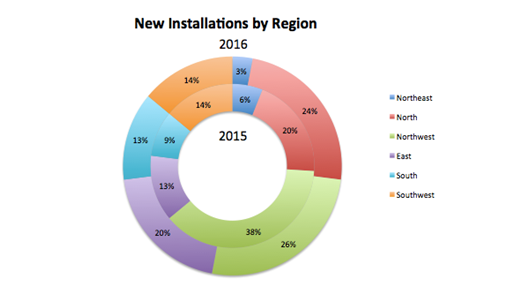 High curtailment in windy provinces is clearly making its mark on new installation patterns. While the resource-rich northwestern provinces still saw the largest share of new capacity additions at 26%, this was down from 2015's whopping 38%. In the face of congested transmission lines and high curtailment, developers are choosing to build closer to load centers, as evidenced by the eastern coastal region of Huadong seeing the largest percent increase in new capacity of any region. 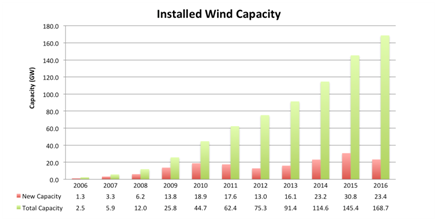 As made clear both by the CWEA wind statistics and the NEA's guiding opinions, the major story for wind in 2017 is China's increasing emphasis on developing wind generation sources closer to eastern and southern coastal load centers. This emphasis on developing wind proximal to load centers can be seen both in the increasing emphasis on offshore wind generation as well as the targets set out in the 13th Five Year Plan to shift development away from windy northern provinces to the south and east. This notice is not the first time Yingli has come into problems with the NYSE's continued listing standards, as the company faced the threat of delisting in November of 2015 as well, when its shares were trading below the $1 threshold for 20 consecutive days. Furthermore, according to Yingli's latest quarterly earnings report, for the third quarter 2016 Yingli suffered an operating loss of $34 million. 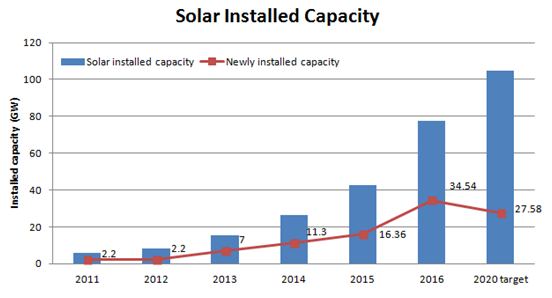 As mentioned in last week's News Update, the frenzied growth in solar in 2016 is largely due to utility scale projects rushing to completion before the large tariff cut in June 2016. However under the Electricity Development Plan, the Solar Power target for 2020 further calls for 60 GW of distributed solar and 5 GW of concentrated solar, with the remaining 45 GW is assumed to be standard utility-scale solar. Thus we expect the next three years to see a moderate cooling of utility scale projects in China as local governments digest current project pipelines. On the other hand, current installation figures indicate distributed solar capacity in China is hovering at around only 10 GW. 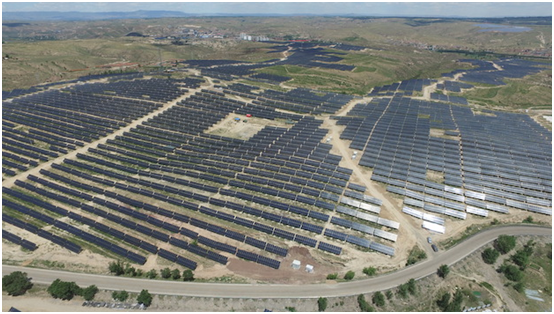 Therefore while the 2020 target of 110 GW target will likely be surpassed, it will be difficult for distributed solar to reach its sub-target of 60 GW, especially as the regions currently driving solar installation figures (Northwest and IMAR) are almost exclusively installing utility scale projects, with distributed projects concentrated more in highly populated east coast provinces.